Howling Turtle : Giveaway: The Percipience Trilogy! For a number of years I have wanted to write a book related to the fears I have regarding the upcoming decades and the strains that we are putting both on the planet and society. While researching topics in these areas however, I found many well written non-fiction books already in print with more coming out on a regular basis. While very informative, they seem to be targeted to people already interested in these subjects. I wanted to reach out to a broader audience and to write something that would hold their attention while covering the areas that troubled me. This led me to look at the eco-fiction genre and hence the Percipience series was born. In my opinion there are three key areas of concern today and these are covered in the first three books of this series. The first is the shear complexity of the problems we face and the short amount time that we have to solve them which is the focus of the first book 2022. The second book, 2222, is centered on the outcomes if we continue our current path and the differences if we choose a more sustainable one. 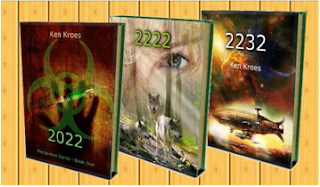 Finally, a few key human behaviors that I feel are the root of our problems are explored in the final book of the series, 2232. Writing the fiction side of the story was fun! The mixture of mystery, conflicts, romance and a bit of science fiction I hope will keep the reader turning pages while at the same time being lightly introduced to my areas of concern. Each book in the series is then followed up with a few short appendices that relate the key themes back to the real world and offer suggestions on actions that individuals can take. This last point is key since my personal belief is that we cannot rely on corporations, governments and other groups to accurately tell us where we are at or to come up with sustainable solutions in a timely manner. We must all work at solving these problems and participate daily in living sustainably, finding new actions to take and communicating to others the importance and urgency of taking these actions. Ken Kroes is the author of the Percipience Eco-Fiction Series. He is passionate about our relationship with our planet and applies his diverse background which includes agriculture, mechanical engineering and information systems into developing fictional worlds that reflect real life issues. Born in Calgary, Canada he has bachelor’s degree in Mechanical Engineering and has had the pleasure of living in many locations in North America and has travelled extensively. Don't want to leave it to chance? Buy the Percipience Trilogy now! I would love to read these books, it sounds very interesting. I don't usually go for these kinds of books, but when you explain what it's about basically, then I find it could be a fasinating read. I usually go for mysteries. I like to read nonfiction books.